A game by RetroRevolution for PC, Mac, Switch, Xbox One, PS4, and Vita, originally released in 2016. 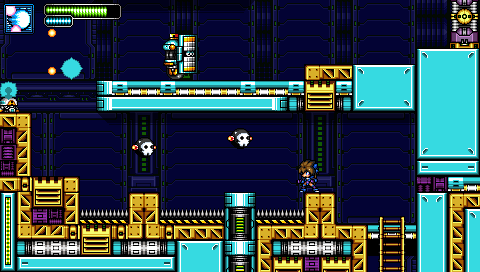 Metagal is an action platformer heavily inspired by the Mega Man series. You take on the role of a cyborg girl named Meta (a.k.a. GAL.00), who is on a quest to defeat General Creeper and rescue her maker, Dr. Ray, along with her cyborg sisters. Unfortunately, her sisters have been turned into battle androids and are now fighting on the side of General Creeper. However, by defeating each of her sisters, Meta can copy their abilities and use these powers to infiltrate Creeper’s fortress and take him down. Meta has a 1.5x variable jump and the ability to dash along the ground for a short distance by double-tapping forward. Each press of the SHOOT button sends out 3 rapid-fire buster shots, and her special move is a cluster of blue and pink energy – very similar to the charge shot seen in later Mega Man titles – which draws from a secondary energy meter. 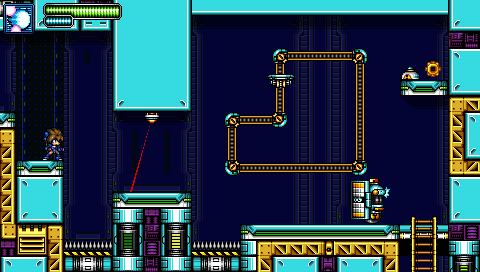 In the game’s original release, the basic buster shot drained energy from the secondary meter as well, but this was removed in order to make the game more accessible. Other elements borrowed from the Mega Man universe are slow panning screen transitions, double sets of doors leading to boss fights, single screen arena battles for each boss, health and energy pods, flashing and being pushed back upon taking damage, insta-death spikes and bottomless pits, multi-screen falling sequences, player-sized bosses and oversized minibosses, an explosive death animation that sends rings of light outward, and of course, the hero comes equipped with an arm cannon. Despite many similarities to the world of the blue bomber, there are some significant differences as well. First off, Meta’s secondary energy meter is shared across all of her weapons and it recharges automatically over time. There are still some occasional energy pod drops from defeated enemies, but these just let her activate her secondary weapon more quickly. Meta can also discover hidden areas that give her passive buffs, one of which allows her secondary energy meter to recharge more quickly. Other powerups include faster shooting and a longer invincibility period. 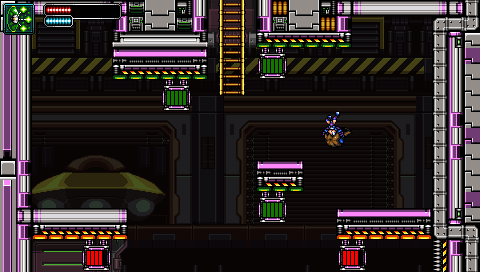 In addition, bosses are not weak to any specific weapon – although some weapons are more effective than others – so there is no “right” weapon to use when fighting a boss. Another difference is the game’s gear system, which gives players the option to respawn at the most recent screen transition instead of the last checkpoint. Levels are quite long, and checkpoints are infrequent, so getting killed can mean a significant amount of repeated gameplay. However, the player is able to collect spinning gold gears, some of which are in hard-to-reach locations. Then, upon death, the player may opt to continue at the last checkpoint, or spend one gear to return to the latest screen transition. This can be a tough choice, as gears do not appear in great abundance, and players may spend one only to find themselves dead a moment later and asked whether they would like to spend another, and gears do not return to the player’s inventory upon reloading a save. The gears do respawn, however, so it is possible to build up a decent cache of them over time if you spend them wisely. While the gears offer a bit of ease to assist players with an otherwise tough experience, they are also a bit of a bandage for some design shortcomings, allowing players to pay their way out of some cheap deaths. 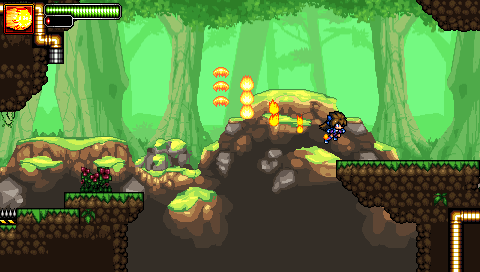 The most common cause for an abrupt demise is contact with spikes, which causes instant death, as opposed to enemies which simply reduce the player’s health meter. In most games, spikes are oversized in order to emphasize their pointy and deadly nature. 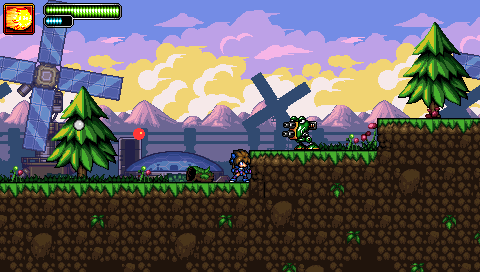 In this game, on the other hand, spikes are narrow and tightly packed, making them blend easily with background elements, particularly in busy environments. This can lead to instances where the player casually walks to his death simply because the spikes do not contrast strongly with other elements. 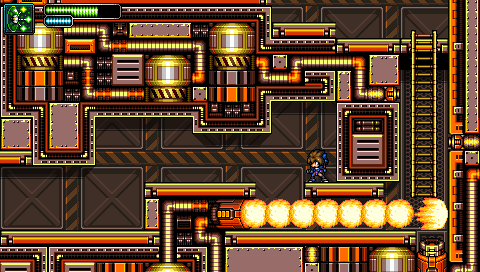 In fire-based areas, the player faces off against wide heat beam turrets that take several seconds to charge up, after which they fire a solid beam in a straight line. 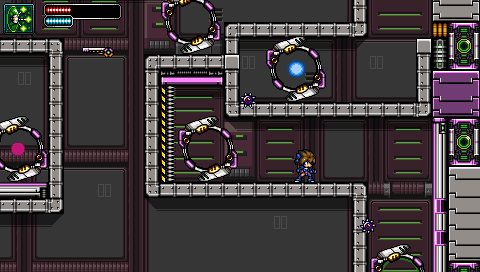 These are also insta-death traps, forcing the player to move within their firing range and attempt to escape before the beams fire, often running down a corridor in a direct line of sight with the turrets. 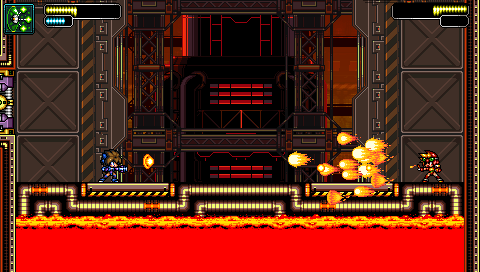 However, once a turret fires, it never shuts off, so it is possible for the player to trigger a turret prematurely and have no way to continue besides walking face first into the hot beam of death. Other niggling issues include the placement of turrets immediately on the far side of screen transitions and lack of a checkpoint before a tough miniboss, as well as some programming oversights, such as oversized door collision that blocks the player from jumping during one of the boss encounters, and a glitch when dashing through a doorway that prevents the player from reaching the final boss (requiring a hard reset and a repeat of the preceding boss rush). Additionally, enemies respawn immediately when scrolled off the screen, leading to situations where the player may be pushed back by taking damage and be forced to face the same enemy again. This is especially true in underwater sequences where the player can jump beyond the height of the screen, leading to situations where the player kills an enemy, jumps, and then lands back on top of the enemy he just killed. In the days of 8-bit Mega Man games, respawning enemies was largely a hardware restriction, but it was balanced by the fact that killed enemies frequently dropped health and energy restoratives, but that is not the case here, as enemy drops of any kind are rare. After completing an initial training area, the player may select between four available levels, each terminating in a battle against one of Meta’s sisters. Upon defeating each boss, the player receives a letter grade ranking and a summary showing enemy deaths, player deaths, completion time, etc., and the player is awarded the power of the defeated boss. These levels may be played in any order, and once all four have been completed, the first level of Creeper’s Fortress unlocks. The fortress consists of four additional levels which must be completed in order. 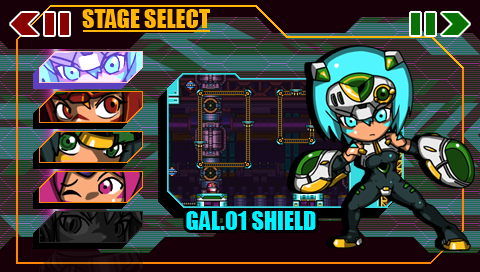 The four cyborg sisters include GAL.01 who uses a shield. She has projectile-based attacks as well, but when her shield is active, she can fire homing beams at the player, and any bullets fired into the shield become homing beams as well, making things tougher for players with itchy trigger fingers. In the player’s hands, this is a devastating weapon, making short work of most regular enemies and even several bosses, especially since its projectiles pass through walls. 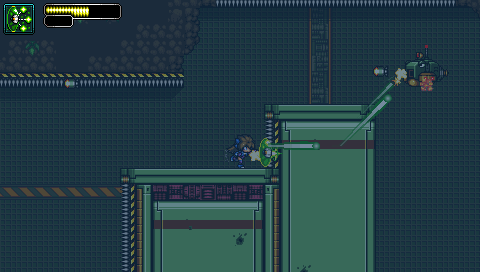 The player can absorb light damage with the shield (removing a chunk of the secondary energy meter in the process) and can unleash homing laser death upon everything on the screen, even when the player is not facing enemies directly… which is particularly useful for delivering continuous damage while running away from charging bosses. The only real downside to this weapon is that it is deactivated upon climbing ladders. 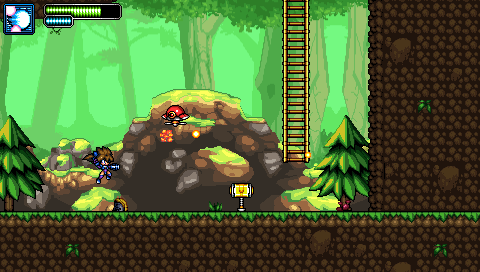 GAL.02 uses a flamethrower and has a flaming dash move, which translates to a similar move for the player, allowing him to dash into enemies, dash across large gaps, and dash away from ladders. 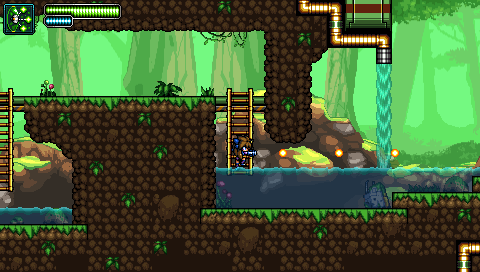 The ability can also be used to uncover a couple of secret areas, but it doesn’t function underwater. 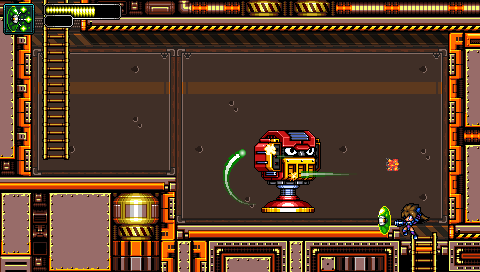 GAL.03 uses a buster weapon, which becomes an odd blob-firing cannon in the player’s hands, allowing the player to lob explosives at enemies and also use these explosives to bounce into the air to access high platforms. The weapon is difficult to use in tight quarters as its projectiles move quickly and bounce off walls. 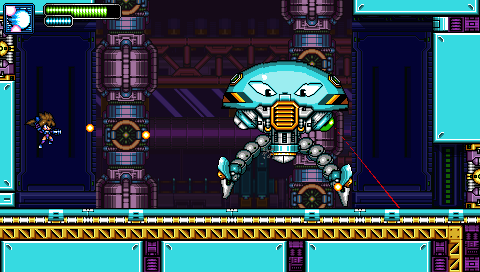 Lastly, GAL.04 uses a gravity-affecting warp weapon, which the player can use to hit tough enemies for continuous damage, or destroy weak enemies and teleport to their location. This is used for environmental navigation in a couple of the more challenging fortress levels, as well as accessig one of the hidden areas. Players must enter the menu to cycle through each of these abilities, so it’s often best to stick with one special weapon and then switch over to deal with specific obstacles or enemies. Aside from a hidden area in each of the first four levels, these additional abilities are not required for environmental navigation, but each of them is required to make it through the fortress levels before reaching the obligatory boss rush and the final encounter with General Creeper. Enemies do not pose nearly as great a threat as obstacles, as there are numerous environmental hazards that cause instant death, including the aforementioned spikes and heat beams, as well as lava and bottomless pits. These obstacles often leave the player with little room to maneuver, and a single slip up means a return to the last checkpoint or the expenditure of a golden gear. 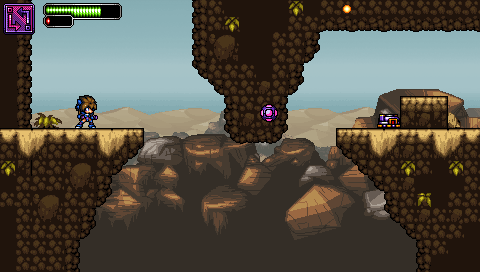 Some levels further alter movement, such as underwater sections where the player can’t dash, but he can jump really high. 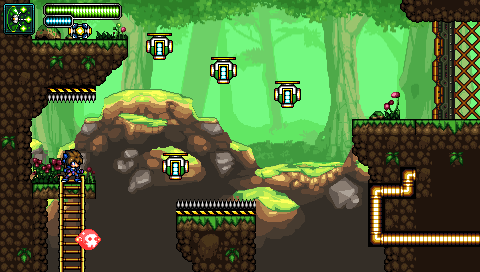 In these areas, players must be wary of death from all sides, as spikes are often placed on the floor, up the sides of walls, and along the ceiling, requiring very precise timing when engaging and disengaging the JUMP button. 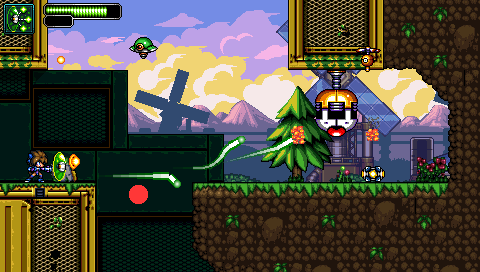 In other areas, players are required to ride on floating platforms that move slowly but explode after a few seconds, giving the player little time to react to what is ahead, and many of these platforms appear over spikes or bottomless pits, often requiring that the player learn the required movements through experimentation and failure. 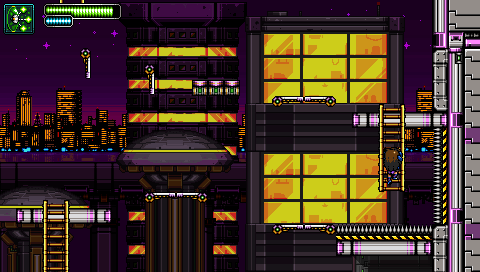 Some late game areas also feature gravity-reversing blocks that work on a timer, allowing the player to stick to the ceiling for a moment, and even perform some upside down platforming, before the effect wears off and sends the player plummeting into the dangers below. Metagal was developed by RetroRevolution , a studio founded in 2013 by artist/designer Tharathon Wattanavikrai and programmer Alberto Dolci, with Tharathon based in Khonkaen, Thailand and Alberto based in Italy. The duo have previously released the mobile titles Chicken Duty and Metaloid: Reactor Guardian, and at the time of Metagal’s release, they were working on Metaloid: Origin. Music for the game was composed by Kamil Sudrajat.